The Sony Cyber-shot RX100 II is an upgraded version of the hugely popular Cyber-shot RX100. You can tell a lot from a name and it’s interesting that this is the RX100 II and not the RX200. It tells you that Sony is pretty confident that it got most things right with the RX100 and it wasn’t necessary to tear it apart and start over, only to revise and update. But while the new RX100 II is much the same size and shape as its predecessor and features the same lens and sensor resolution, there’s a great deal of important upgrades. 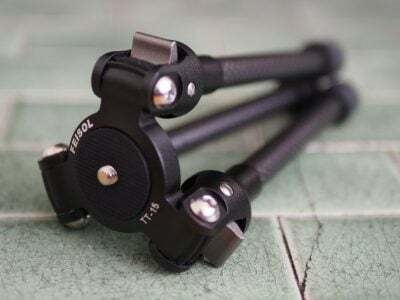 First is the hotshoe which not only supports external flashes, but also an external microphone accessory and a fantastic optional electronic viewfinder. Then there’s the screen which may still not be touch-sensitive, but now flips out vertically for easier composition at high or low angles. Another important upgrade is Wifi connectivity. The RX100 II has built-in Wifi and is the first Sony model to complement it with NFC to simplify the initial negotiation with compatible devices like Samsung’s Galaxy S3, S4 and Google’s NEXUS 4, 7 and 10. The icing on the cake is the new back-illuminated Exmor R sensor which provides an extended ISO sensitivity range as well as genuinely lower noise at equivalent ISO settings compared with its predecessor. In combination with the bright f1.8 lens and features like the Multi Frame Noise Reduction and HDR stacking modes, the RX100 II is even better in low light conditions than the model it replaces. Other refinements include a mult-terminal USB port that takes a wired remote and a new step zoom function for the lens control ring. Before my final verdict, lets see how it stacks up against the Fujifilm X20, Lumix LF1 and the Nikon COOLPIX A. Like the Sony Cyber-shot RX100, the Fujufilm X20, which is an upgrade to the X10, is an advanced compact with a fixed zoom lens and a larger sensor than a typical point-and-shoot. But rather than compactness and portability, the emphasis is on retro rangefinder styling and plenty of physical control. Put crudely, the X20 is bigger and heavier with more knobs and dials. The differences go beyond the exterior appearance. The X20 features the same unconventional X-Trans architecture as the X-Series mirrorless compacts including the X-Pro1, but this isn’t an APS-C sized sensor, its a 2/3 inch sensor which is smaller than the 1 inch sensor in the RX100 II. It still produces excellent quality images, but it can’t match the RX100 II for high ISO noise performance. At 12 Megapixels it produces much lower resolution images than the 20 Megapixel RX100 II, but that’s only really going to be an issue if you like to make big prints. Which brings us on to the lenses. The X20’s fixed zoom has an equivalent range of 28-112mm, which closely matches the 28-100mm range of the Sony RX100 II. But where the Sony’s zoom is powered, the Fujifilm X20 has a physically coupled manual zoom operated by a zoom ring which also extends the lens and turns the camera on. The X20’s f2-2.8 lens isn’t as bright as the RX100 II’s f2-4.9 lens at the wide angle setting, but doesn’t close down so much at the telephoto end of the range. So, despite its smaller sensor the X20 can actually throw backgrounds out of focus for portraits a little more effectively and its very close focussing makes it a better choice for close-ups. For low light shooting though, the RX100 II’s brighter maximum aperture at the wide angle setting, combined with its back-illuminated sensor and wealth of stacking modes wins out. The Sony RX100 II has a new flip-out screen which is also bigger and higher resolution than the fixed 2.8 inch 460k dot screen on the Fujifilm X20. But Fujifilm, renowned for innovation in viewfinder design, has equipped the X20 with an advanced optical viewfinder that overlays exposure and focus information. You can add a very good optional EVF accessory to the RX100 II via its new multi-interface hot shoe, but it’s not as convenient as a built-in viewfinder and adds extra expense, plus you can’t then attach an external flash. Like the RX100 II the Fujifilm X20 also has a hot shoe. Both models offer the traditional PASM shooting modes in addition to Auto modes and effects filters, but the Sony has more to offer, with easy-to-use Photo creativity modes, Sweep panorama and a range of stacking modes. The RX100 II is also a much more capable movie camera with a dedicated movie record button and a much wider range of HD recording modes. And, as always, there’s cost to consider. With the Fujifilm X20 currently priced around 25 percent lower than the RX100 II, it looks like a very attractive alternative. But before even considering the X20, you need to think carefully about what you want from an advanced compact and weather the X20 will provide it. See my upcoming Fujifilm X20 review for more details. The Nikon COOLPIX A makes an interesting alternative to the Sony RX100 II. On the face of it, it offers a similar basic proposition, DSLR image quality in a compact form, but it takes a much less compromising route than the RX100 II. The COOLPIX A is all about the sensor, so let’s start there. It’s the same sized APS-C sensor as used in Nikon DX-format DSLRs and indeed is probably the very same 16 Megapixel sensor as in the old mid-range D7000. It’s substantially bigger than the 1 inch sensor in the RX100 II and in my tests it resolved more detail with less noise. With a bigger sensor you’d expect a bigger body; the COOLPIX A is a little larger than the RX100 II, but not massively so and you can still slip it into a coat pocket. Nikon has gone to great lengths to keep the size down and one of the ways it’s done it is to fit the COOLPIX A with a 28mm f2.8 fixed focal length lens. While there are many enthusiast photographers who will happily get by without a zoom, few would consider a 28mm wide-angle a good choice for general purpose shooting though. So while it’s great for landscapes and interiors, the COOLPIX A can’t compete with the RX100 II’s 28-100mm zoom for portraits and its bigger sensor advantage doesn’t translate into shallow depth of field other than for very close subjects. The COOLPIX A has a fixed 3 inch 921k dot LCD screen that can’t flip up and down like the articulated screen on the Sony RX100 II. And while both models have a hot shoe that takes an external flash, the RX100 II’s ‘multi-interface’ port will also take an accessory EVF. You can fit a viewfinder attachment to the COOLPIX A, but it’s optical, not electronic and it costs around the same as the 2,359k dot EVF accessory for the RX100 II. Like the RX100 II, the COOLPIX A sports PASM exposure modes as well a point-and-shoot Auto mode, but it lacks the depth of feature modes provided by the RX100 II, with no scene detection, no Easy Auto mode or anything like the RX100 II’s Creative styles, no panorama, no stacking modes and no effects filters. It does have one feature the RX100 II lacks, an excellent interval timer, but the balance is well and truly stacked in the RX100 II’s favour. The RX100 II’s continuous shooting is twice as fast as the COOLPIX A, I measured it at nearly 11fps compared with 4.5fps on the COOLPIX A. And the RX100 II has a dedicated movie record button, making spontaneous movie recording easier than on the COOLPIX A. It also provides more control over exposure when recording, but both models are fairly evenly matched for HD movie modes though. The COOLPIX A is around 30 percent more expensive than the RX100 II, but, as with the Fujifilm X20, it’s not really about the price. There’s a pretty clear dividing line between these two models. There are those for whom sensor size is the most important factor, and are prepared to compromise on other things for a compact that delivers DSLR quaility with no caveats. The RX100 II compromises on that goal marginally, but gains a lot more besides compactness in return. See my Nikon COOLPIX A review for more details. Sony’s Cyber-shot RX100 and the updated RX100 II redefined what we could expect from an enthusiast-class compact, and as such it’s fair to say this is the camera that represents the major competition for the Canon S120. So how do they compare? Physically both cameras share roughly the same profile viewed from the front, but the RX100 II is almost 1cm thicker and almost 50% heavier too. Now this doesn’t make the RX100 II a large camera, but the Canon S120 is noticeably slimmer and lighter. I found I could squeeze it into most trouser pockets for example, whereas the Sony often needed a bit more space. In terms of optics, the S120 has a broader 5x range equivalent to 24-120mm compared to 28-100mm on the RX100 II. The focal ratio starts a tad brighter on the S120 at f1.8 compared to f2, and while the Sony appears faster when fully zoomed-in at f4.9 compared to f5.7 on the Canon, the S120 actually shares essentially the same aperture when set to the RX100 II’s maximum zoom of 100mm. The S120’s lens also offers a built-in ND filter which can be handy for long exposure work, although it’s only 3 stops. Both cameras offer high resolution 3in screens, but the S120’s is touch-sensitive while the RX100 II’s can tilt vertically. This is a tough one to weigh up as both have their uses and you’ll need to decide which best suits you personally. But one important advantage the Sony has over the Canon is the chance to fit and external electronic viewfinder accessory. Both cameras can shoot 1080p video at 60fps, but the Sony RX100 II offers full PASM exposure control options along with manual focusing with focus peaking assistance while filming. Its hotshoe also allows you to mount an external microphone accessory which all makes it a more professional choice for video. But it’s not completely one-sided as the S120 lets you apply the popular miniature effect to movies, offers a couple of slow motion options (albeit at sub-HD quality), and its touch-screen allows you to pull-focus simply by tapping. In terms of continuous shooting, both cameras can shoot at their full resolution at around 10fps, but the RX100 II slows down to 2.5fps after 13 frames (which takes about one second) whereas the S120 is happy to keep shooting at this speed until it runs out of memory. Moving onto connectivity, the RX100 II is much better-served with its hotshoe and accessory interface supporting external flashes, microphones and cable releases. Both cameras have built-in Wifi, but while the Canon S120 is limited to sharing and tagging images, the RX100 II additionally offers basic smartphone remote control and it supports NFC as well. You can also charge the RX100 II over USB whereas the S120 requires a mains-powered charger. Both offer a wealth of shooting modes. The S120 sports a neat new Starry Sky set of presets for easy astrophotography and also lets you dial-in exposures as long as 250 seconds direct from manual mode. In contrast the RX100 II’s maximum dialable-exposure in manual is 30 seconds, although the Bulb mode lets you expose for several minutes if desired. The RX100 II also features an auto panorama mode, something that’s still sorely lacking from any Canon. Arguably the biggest difference though is the sensor: a 1in type sensor with 20 Megapixels on the RX100 II versus a 1/1.7in type sensor with 12 Megapixels on the S120. So the RX100 II’s sensor not only has over 50% more pixels in total, but 2.8 times the surface area. In my tests the S120 came close to recording similar degrees of real-life detail in good light and at low ISOs, but above 400 ISO and especially 800 ISO, the RX100 II’s bigger sensor simply records more light with less noise. But do have a look at my Canon S120 quality pages to see the differences in practice as they may be closer than you think. Also check out the first page of my review where you’ll see the RX100 II can deliver a slightly shallower depth of field than the S120, but again not quite as much as you might expect. The final aspect to weigh-up is the price with the Sony RX100 II costing over 50% more than the S120. This coupled with the S120’s more pocketable dimensions could swing it for some enthusiasts, although others will be smitten with the bigger sensor, but as you can see above, there’s lots of smaller features to weigh-up too. Ultimately though, while the RX100 II is more expensive than the S120 and is thicker too, it remains an extremely compelling prospect for enthusiasts looking for a compact. If you’re looking for a truly pocketable compact with enthusiast-class features, you should also be considering Panasonic’s Lumix LF1. The RX100 II and LF1 are quite different cameras, but have some interesting things in common, most notably the inclusion of Wifi with NFC, allowing easy wireless remote control and image transfer. In its favour, the RX100 II features a larger 1in sensor with a higher 20 Megapixel resolution. This sensor has 2.7 times the surface area of the 1/1.7in sensor in the LF1, allowing it to capture both finer details at low sensitivities, and suffer from less noise. The RX100 II features 1080p video, a screen which vertically tilts up and down to allow easier composition at high or low angles, and a hotshoe which can accommodate flashguns, external mics and a superb electronic viewfinder, although the latter greatly adds to the cost and the overall size. The RX100 II also supports an optional cabled remote control. In its favour, the LF1 is much thinner, making it a camera you can squeeze into a trouser pocket, whereas the RX100 II is just a bit too thick for tighter pockets. The LF1 also features a longer optical range of 28-200mm compared to 28-100mm, giving it twice the reach at the telephoto end. The LF1 also features an electronic viewfinder, which while not a patch on the RX100 II’s accessory, is built-into a body that’s also smaller. And finally, the LF1 comes in at about half to two thirds the price of the RX100 II – and that’s before you’ve added the viewfinder to the Sony. So there’s quite a few things to weigh-up here, but again a lot boils down to how much you desire the size of the LF1 and the convenience of its basic but built-in viewfinder. See my Panasonic Lumix LF1 review for more details. 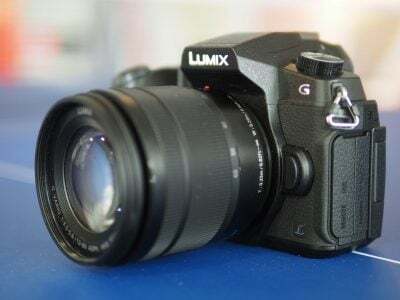 The Lumix GM1 is the World’s smallest mirrorless system camera, and amazingly manages to be roughly similar in size to the RX100 II while boasting a bigger sensor and the chance to swap lenses. So how do they compare? Both bodies are roughly the same size when viewed from the front and pack large sensors, 3in screens, 1080 movies with manual exposure control, built-in Wifi and focus peaking that works while filming video; they’re also roughly the same price. 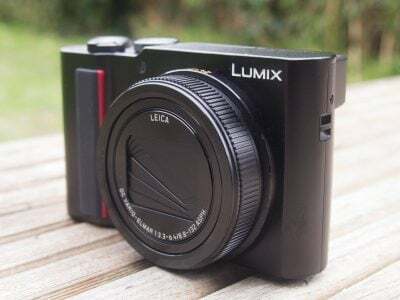 See my Panasonic Lumix GM1 review for more details. Like the best-selling RX100 before it, the Sony RX100 II delivers the same magic potion of large sensor performance in a compact format. When I wrote about the RX100 back in 2012 I said some people will ‘complain it lacks a hotshoe, or an accessory port for a viewfinder, or that its screen isn’t articulated’. These shortcomings didn’t prevent the camera from selling like hotcakes, but it’s uncanny those are exactly the things Sony decided to fix, along with also providing built-in Wifi with NFC and a cabled remote option. There’s even the chance to mount filters via an optional accessory, although this also works on the older RX100. Changing the sensor for a back-illuminated version of the same resolution is also a very canny move. I don’t recall many folk complaining about the image quality on the RX100, but now it’s genuinely better at higher sensitivities. It would have been easy for Sony to stick with the existing sensor and concentrate on the physical or software upgrades, but it’s refreshing to find an upgrade in this respect. It makes the RX100 II a better complement or even replacement for a larger camera. There are still one or two niggles. First the absence of a touchscreen is a shame for those who like tapping to change focus points, not to mention swiping through images or pinching to magnify during playback. Then there’s the digital zoom, which infuriatingly can’t be disabled when shooting video. Some will also wish the aperture didn’t slow down so much when zooming to telephoto. A brighter aperture at the telephoto end would allow lower ISOs for better quality, faster shutter speeds to freeze action and shallower depth of field effects. But equally it would necessitate a larger, heavier and more expensive lens, especially for the RX100 II’s sensor size. A compromise has to be made and for the RX100 II – and its predecessor – Sony has gone for size. In my view the original RX100 delivered one of the most compelling balances of sensor size, lens specification and body size to date, and the RX100 II manages to improve on it further with a bunch of upgrades including even better image quality. It’s a corny phrase, but one of the best compact cameras just got better. The RX100 II is an easy camera to Highly Recommend. Big sensor, pocketable compact form. Built in Wifi with NFC. Excellent low light & high ISO performance. Hotshoe supports external flash, EVF and mic. Slow f4.9 maximum aperture at 100mm. Digital zoom can’t be disabled for movies. No miniature effect mode for movies.